During the project, Moekotte was responsible for the project direction, support and planning. The installation work was evenly shared amongst the contracting companies. Moekotte for example laid and spliced all of the fibre optic cabling. The installation of the fire alarm system was a project in itself, because it required the collaboration of the fire department and R2B (a fire safety inspection body). Due to the process conditions (such as steam), the installation also required specific recording instruments, which Moekotte happily provided. During the construction of the new Grolsch complex, Moekotte was contracted for all building-related systems, the lighting system, wiring for the lights and power supply, installation of the fire alarm system, construction of the telephone and data communications infrastructure, and installation of the access control system. We entered into a collaboration with Holec and Essent for the medium and high voltage installations. Different bus systems were used when wiring and connecting the processing systems, including for example shut-off valves, temperature recorders and pressure recorders. Once completed all works it turned out that the workers had all remained within the tight time schedule, despite the frequently hectic working atmosphere. Thanks to our energetic attitude, Moekotte was one of the driving factors in achieving this. During our joint venture in the E-Plooy general partnership, it was remarkable how easily the different business cultures merged, whilst everyone was working to achieve a common goal. 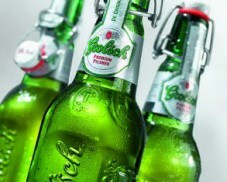 Grolsch was therefore also highly satisfied with the way in which the project was implemented.